CARMEL, Calif. – July 22, 2016 – Automotive Fine Arts Society (AFAS) member Niles Nakaoka will unveil three new paintings that celebrate racing at the Pebble Beach Concours d’Elegance® Aug. 21, 2016, from 9:00 a.m. to 4:30 p.m., in Pebble Beach, California. Nakaoka is a self-taught artist and Formula One fan with a specialty in transforming rare snapshots into automotive settings. Sponsored by The Lincoln Motor Company, the 2016 AFAS exhibit at the 18th fairway of Pebble Beach Golf Links in beautiful Pebble Beach, California, will showcase the latest creations from the world’s finest automotive artists. One of the pieces Nakaoka will showcase is titled, “Bullpen”. 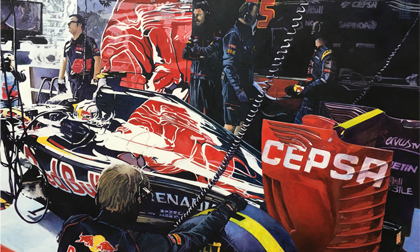 An 22” x 28” acrylic on canvas, this painting is set in the fast-paced Toro Rosso garage with renowned driver Max Verstappen. Nakaoka’s painting offers a snapshot into this iconic garage/driver duo creating a once-in-a-lifetime feeling. Incorporating a realistic viewpoint with soft blurred edges, the painting portrays an intimate view of the racers in action. Another of Nakaoka’s paintings to be on display at Pebble Beach titled “Vettel” showcases an uncommon yet artistic aerial viewpoint of Sebastian Vettel in the beautiful SF16-H Ferrari. Using bold colors and dynamic imagery, this 24” x 36” acrylic on canvas employs a unique birds-eye perspective. Nakaoka’s final work is titled “Massa”, an 18” x 24” acrylic on canvas. This highly detailed painting portrays Felipe Massa, one of the veteran drivers in a Williams. Featuring the timeless Martini Rossi graphics, this crystal-clear shot of the vehicle contrasted with the blur of the road creates a live-motion feel to the painting. It was around the time of the US Grand Prix in Phoenix in the late 1980s that Nakaoka became an automotive artist, after being inspired by the work of Hector Bergandi. He prefers Formula One cars because their open wheels impart a feeling of speed. He paints the driver–his favorite part–last of all. Ironically, this Hawaiian Islands resident is thousands of miles from any race tracks. He tries to attend at least one major open-wheel race a year, but relies mostly on friends to supply him with photographs for subject matter. A surfer and snow skier, he sees parallels between his two favorite activities and racing cars. Nakaoka’s artwork has been featured in car enthusiast magazines like Road & Track, Racer, Championship Racing, Cavallino, the Russian magazine, “Autopilot,” as well as the cover of Sports Car Market.